Key to success in Apex Legends firefights is picking the right combination of guns. You can only hold two at any given time, so you’ll need to make sure your choices not only suit your playstyle and situation but also synergise well with one another. Our Apex Legends loadout guide will walk you through how to make good choices while picking your weapons over the course of a match. We’ll also take this opportunity to go over some of the most powerful and popular weapon combos currently being used in Apex Legends since update 1.1.1. For a more general overview of Apex Legends and everything it does differently from its competitors, take a look at our Apex Legends tips/guide. You’ll also find links there to all the other pages in our Apex Legends guides series, from detailed stats and spray patterns on all the Apex Legends guns/weapons to finding the best loot and the best places to land in our Apex Legends map and locations guide. At the beginning of every match in Apex Legends, you start with nothing and must quickly gather up as much nearby loot as possible, from weapons and attachments to armour and healing items. As time goes on you’ll find more weapons scattered around and must begin to choose whether to abandon your current setup or stick to it. And to make these decisions properly, you need to be able to evaluate your situation and your own personal style of play. It’s also worth factoring in your available attachments. Whenever you hover your cursor over a weapon on the ground, Apex Legends’ UI will tell you which of your attachments from your inventory or your current gun will fit into that weapon. For example, if you have a fully kitted out Peacekeeper, you might want to think twice before swapping it out for an attachment-bereft Devotion. Rules are made to be broken, but if you’re just starting out it’s probably best to abide by the below three golden rules before you branch out into bizarre-o territory with your weapon loadouts. At least one full-auto weapon. You’ll see that I do break this rule with one of the loadouts listed below, but it’s often a very good idea to keep at least one fast-firing weapon on you at all times, whether it’s an R-99 or a Spitfire. At least one close-range option. Apex Legends is a fast-paced, mobility-oriented game, and as such most fights tend to be close-quarters. You can do without a long-range weapon if you like, but you really can’t do without a close-range option. Shotguns and SMGs are generally your best choice here. Preferably a combo that covers all ranges. Again, you can do without a sniper rifle if need be, but if you stick purely to close range or medium range weapons (if, for example, you pick two shotguns, or a Scout and a Flatline) then you may run into trouble against certain enemy teams with loadouts more suited to the encounter. Certain guns, such as the Wingman and the R-301 Carbine, are effective at pretty much any range, so they’re a good option when it comes to this rule. Beware of ammo requirements. Your inventory size is limited, and certain guns eat up ammo incredibly quickly. If you have one such weapon (an LMG or SMG), then it might be a good idea to make your other weapon a low-ammo-requirement gun such as a Wingman or Shotgun, to make space for the ammo you need for your other weapon. Use attachments to guide your loadout decisions. Guns in Apex Legends are only as good as their attachments. If you’ve a Prowler without a Selectfire Receiver, but you do have a purple Light Mag and you spot an R-99 lying around with some ammo, then it’s probably better to make the swap. Attachments trump nearly any disparity in general weapon strength. 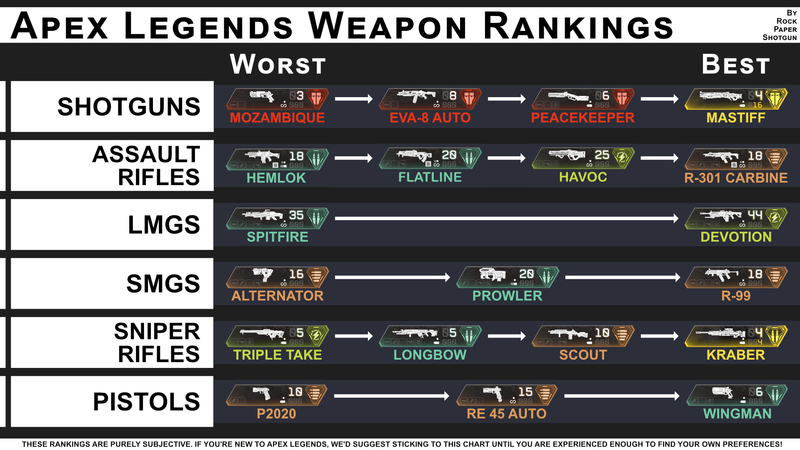 Now let’s take a look at some of the most popular weapon combos currently in Apex Legends which you’re likely to see heading into the end-game of each match. There is of course a degree of customisation to all of the below loadouts (you can switch out a Peacekeeper for a Mastiff, for example, or a Devotion for a Spitfire) but they give you an idea of the loadouts to look out for. Pros: The R-301 and the Peacekeeper are both top-tier weapons, and together they cover all effective ranges. You’ve got an effective full-auto weapon to switch to after exhausting your Peacekeeper shots at close range, and both weapons are competent even without attachments. Cons: There are slightly better choices for straight-up DPS than an R-301 (but none of them are as easy to control over longer ranges), and if you’re at very long ranges your firepower will be ineffective. Alternatives: the R-301 can be replaced with a Flatline or even a Spitfire if need be, but neither are as easy to use over long distances. The Peacekeeper can be traded in for an EVA-8 Auto if you prefer, trading damage for a faster rate of fire and greater mag size. Pros: Both these weapons are full-auto and will shred enemies at close-range. Prioritise the R-99 in close-quarters combat, and over longer distances let the Carbine do its work. Cons: Both guns require lots of Light Rounds, and they also require exactly the same attachments, which means you’ll need to find two of each attachment to fully kit out your loadout. Alternatives: Again, the R-301 can be traded in for a Flatline or other long-range auto option, while a good choice to replace the R-99 would be a Prowler with the Selectfire Receiver Hop Up. Greater range and mag size, and allows for some disparity in attachment slots from the R-301. Pros: Two of the strongest weapons in Apex Legends combine to deal with all effective ranges very nicely. Both guns are also extremely ammo-efficient, so you can get away with carrying just one stack of Shotgun Shells and one stack of Heavy Rounds. Cons: You need to be very good at landing your flick shots with both these guns, and there’s no full-auto option to fall back on, which makes the Extended Mag and Shotgun Bolt attachments even more of a necessity – particularly since the 1.1.1 nerf to the Wingman’s magazine size (read more over at our Apex Legends update guide). Alternatives: Trade in the Wingman for a Scout for the ability to attach more powerful scopes as well as a faster rate of fire and greater magazine size (but you lose out on damage), and, as usual, you can trade in the Peacekeeper for the EVA-8’s faster fire rate (perhaps a better idea in this case than most, due to the lack of full-auto option). Pros: Swapping out the Peacekeeper for the Spitfire gives you a very powerful full-auto option with bullets for days (again, even despite the 1.1.1 update nerfing both these weapons). Both Spitfire and Wingman can perform admirably at close range, though you should definitely use the Wingman for longer distances as, even with a Barrel Stabiliser, the Spitfire’s recoil hinders you here. Cons: You lack the reliability of a Shotgun for close-range encounters, and you won’t have the DPS of something like an R-99 either. You’ll also need tonnes of Heavy Ammo for your Spitfire, as well as two good Extended Heavy Mags to make full use of this pairing. Alternatives: The Spitfire can be traded in for a Devotion (if you find a Turbocharger) or an R-301 (if you want less recoil and/or you have good Light attachments). The Wingman, again, can be traded in for a Scout if you really prefer, but I’d advise against it. Pros: Unmatched close-range power, good balance of attachments and ammo requirements. Start with a Peacekeeper shot, then quickly switch to the R-99 and finish them off. Cons: You really need a good Light Mag for the R-99, because it drains its magazine so very quickly and once that happens all you have to fall back on is a slow-firing Peacekeeper. Your mid-range options are very limited (and long-range options non-existent) so you’ll need to be very good at closing down enemies and forcing short-range engagements. Alternatives: The usual Peacekeeper/EVA-8 tradeoff applies here; but for the R-99, you could sacrifice a little bit of the sheer DPS for the longer effective range of the Prowler. Really it’s down to the attachments you find. Pros: The Prowler covers close- and mid-range encounters, allowing you to make good use of a sniper like the Longbow, particularly after its excellent series of buffs in 1.1.1 increasing its rate of fire and mag size, and decreasing the weapon sway and leg shot damage reduction. This is also a loadout that more or less negates the necessity for Barrel Stabilisers, as the Prowler doesn’t use one and the Longbow doesn’t really need one to be effective. Cons: You need to kit that Prowler out as well as possible, because you’ll be relying on it for the majority of your fighting. Ideally a Purple Heavy Extended Mag and a Selectfire Receiver for full-auto mode. Alternatives: You can use pretty much any sniper rifle in the Longbow’s place (Kraber would be excellent if you have the chance). As for the Prowler, the only other gun that does as good a job at dealing with both close range and medium range threats is the R-301 Carbine. Again, it depends on the attachments and ammo you find. Pros: The Hemlok is the Assault Rifle with the longest effective range thanks to its superb bullet velocity and burst-fire mode. You can also make excellent use of its single-fire mode if you don’t like the burst-fire The R-99 gives you a very dangerous close-range option. Cons: You’ll need at least a couple of stacks of both Light and Heavy Rounds (preferably more), and you’ll need a lot of attachments to make this loadout work to the best of its ability. You’ll also need to be very familiar with the Hemlok’s firing modes to make good use of it. Alternatives: Any Assault Rifle could replace the Hemlok, trading a little bit of range for an easier ride in general. The R-99 could be replaced either by a Prowler or a Shotgun such as the Peacekeeper (though be wary when doing this because you’ll be without a full-auto option). Pros: With the Hop Ups, these guns are exceptionally powerful at close and medium ranges. You’ll be able to provide sustained fire long beyond what nearly any other viable loadout can offer, and you’ll only need a single Barrel Stabiliser and a single Extended Mag. Cons: You’ll need a good Backpack to hold the vast amounts of Energy and Heavy Rounds you’ll need to make this work throughout an entire match. This loadout is also made or broken by whether you can find the Selectfire Receiver for the Prowler and the Turbocharger for the Devotion. Without one or both of these, you’re probably best suited to other weapons. Alternatives: The Devotion can be traded in quite easily for a Spitfire, while the Prowler can go in many different directions if need be, most of which we’ve already covered (R-301, R-99, Peacekeeper, or even the Wingman would be viable alternatives). Those are the main candidates for the most popular loadouts in Apex Legends so far. But keep checking back here, because everyone’s still learning this brand new game and the weapon combo meta has yet to settle, so we’re bound to see some more interesting and experimental loadouts as time goes on.